For most men and women no toilette is complete without a spritz of their favourite scent and, whether chartered or owned, this includes adding a bottle to the superyacht dressing table. This spring opt for perfumes that look as good as they smell by eschewing crystal bottles and diffusers for limited edition works of art that are guaranteed to live up to their bespoke master suite surroundings. Inspired by the graceful flight of a swallow and featuring notes of Florentine iris, cedarwood, black pepper and bergamot, Lalique’s refreshing new fragrance is seductive enough by itself. However, present it in one of 12 limited edition bottles and it becomes the scent of a perfume lover’s dream. Each bottle is hand-crafted by four of the house’s master glassmakers and finished with four 22.5ct gold leaf art-deco swallows designed by Ateliers Gohard, the artists behind the dome and cupola of L’Hôtel des Invalides. It takes a further five to creat the iris-embossed stopper before the bottle is placed in a white lacquered wooden coffret, containing cleverly concealed jewellery compartments based on Rene Lalique’s own jewellery boxes. One of the world’s most famous fine perfumers, Caron customers are spoilt for choice when it comes to stunning scent bottles. Our pick, however, has to be the incredible Poivre 50th Anniversary Edition, which comes mounted on a rickshaw in commemoration of the original 1956 advert. 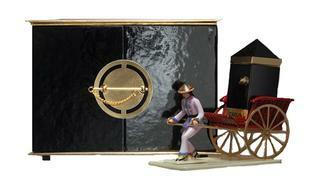 Handcrafted from Limoges porcelain, each rickshaw takes over five hours to make and is presented in a black and gold Chinese chest of drawers, with the scent itself encased in a striking replica spice box to reflect the unisex perfume’s peppery top notes. 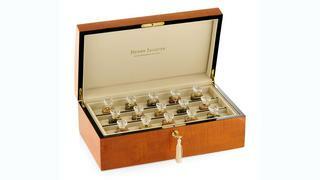 Ideal for those who like to change their scent on a regular basis, this beautiful wooden case from Henry Jacques contains 15 crystal flacons of the house’s classic fragrances. Each housed in their own compartment and finished with gold appointments and an intricate tasselled key, it is a chic and understated chest you’re guaranteed to treasure. To celebrate the opening of the Salon de Parfum boutique at Harrods in 2014, haute perfumier Clive Christian created a created a unique edition of his signature perfume No 1. 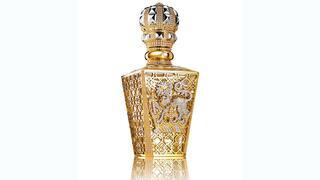 Already famous for its reputation as the world’s most expensive perfume, No 1 Passant Gardant is housed in a 24 carat gold latticed crystal bottle set with over 2000 white, yellow and pink diamonds depicting a lion ‘guarding’ the fragrance’s gold and diamond crown stopper. However, with only one available, and a price tag of £143,000, you may prefer to opt for the perfume’s original (and still lovely) crystal and gold bottle. 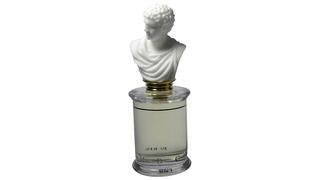 What could be more fitting for a yacht cruise around the coastline of Greece or Italy than the statuesque Limoges porcelain bust atop Parfums MDCI’s Ambre Topaki fragrance? Created for the niche brand by renowned perfumer Pierre Bourdon, this bracing scent is characterised by herbal, earthy and warming notes suitable for both men and women, and comes in limited edition numbered and signed bottles.